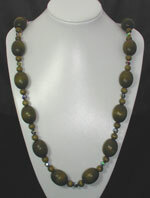 Moss green is the best way to describe the beautiful colour of these wooden beads. When I saw them they conjured up images of a grand peacock so I did a bit of experimenting and found the best swarovski beads to carry on this theme. The big chunky 1" beads are perfect for this seasons trend and the smaller 1cm wooden beads work perfectly together with the 8mm swarovski coated beads.The swarovski beads have been coated to give a multi coloured effect of purples, greens and blues. This 26" necklace, complete with gold filled(hard wearing)hook clasp would make a perfect accessory for this season.